Russian three-crew manned spacecraft. Designed for use as a lifeboat for the International Space Station. After the retirement of the US shuttle in 2011, Soyuz TMA was the only conveying crews to the ISS. Except for the Chinese Shenzhou, it became mankind's sole means of access to space. Launched 2002 - 2011. AKA: 11F732;7K-STMA. Status: Operational 2002. First Launch: 2002-10-30. Last Launch: 2015-09-02. Number: 40 . Thrust: 3.92 kN (881 lbf). Gross mass: 7,220 kg (15,910 lb). Unfuelled mass: 6,320 kg (13,930 lb). Specific impulse: 305 s. Height: 6.98 m (22.90 ft). Diameter: 2.20 m (7.20 ft). Span: 10.70 m (35.10 ft). It incorporated several changes to accommodate NASA requirements, including more latitude in the height and weight of the crew and improved parachute systems. The spacecraft also incorporates two new amber cockpit displays. In addition to the three crew, the TMA could deliver up to 100 kg of payload to the station and return up to 50 kg. From 2009 Soyuz TMA's flew with the new TsVM-101 computer in place of the old Argon-16 (introduced on Soyuz-T in the 1970's). The TsVM-101 was much more capable, much smaller, and 9 times lighter (8.3 kg vs. 70 kg). In connection with this the analogue telemetry system was replaced by a smaller digital system. This modifications was originally planned in the late 1990's, but shelved for financial reasons. However the NII Argon design bureau discontinued production of the old computer, forcing RKK Energia to fund development of the TsVM-101 at NII Submikron in Tselenograd. Soyuz TMA's equipped with the new computers received the new article number 11F732A47 with a new serial number series beginning with 701. The computers were installed in the service module. In a second modification, but no earlier than 2010 the KS-020M descent module computer, used for control during re-entry, would be replaced with the TsVM-101, which would be moved from the service module to the descent module. Crew Size: 3. Orbital Storage: 200 days. Habitable Volume: 9.00 m3. Spacecraft delta v: 390 m/s (1,270 ft/sec). Electric System: 0.60 average kW. Family: Manned spacecraft, Space station orbit. Country: Russia. Engines: KTDU-80. Spacecraft: ISS, Soyuz TMA SA, Soyuz TMA BO, Soyuz TMA PAO. Launch Vehicles: R-7, Soyuz-U, Soyuz-FG. Propellants: N2O4/UDMH. Launch Sites: Baikonur, Baikonur LC1, Baikonur LC31. Agency: Korolev bureau. Bibliography: 2, 528, 552, 554, 6911, 13137, 13138. Soyuz TMA, X-38 selected as ISS lifeboat over Alpha Lifeboat - . Nation: Russia. Program: ISS. Spacecraft: Alpha Lifeboat, ISS, Soyuz TMA, X-38. The Alpha lifeboat was based on the Zarya reentry vehicle with a solid retrofire motor and cold gas thruster package. The design was rejected in favor of use of modified Soyuz TM in short term, US X-38 in long term..
2002 October 30 - . 03:11 GMT - . Launch Site: Baikonur. Launch Complex: Baikonur LC1. LV Family: R-7. Launch Vehicle: Soyuz-FG. Soyuz TMA-1 - . Call Sign: Yenisey. Crew: De Winne, Lonchakov, Zalyotin. Payload: Soyuz TMA s/n 211. Mass: 7,250 kg (15,980 lb). Nation: Russia. Related Persons: De Winne, Lonchakov, Zalyotin. Agency: RAKA. Manufacturer: Korolev bureau. Program: ISS. Class: Manned. Type: Manned spacecraft. Flight: Soyuz TMA-1 ISS EP-4. Spacecraft Bus: Soyuz. Spacecraft: Soyuz TMA. Duration: 185.96 days. Decay Date: 2003-05-04 . USAF Sat Cat: 27552 . COSPAR: 2002-050A. Apogee: 295 km (183 mi). Perigee: 278 km (172 mi). Inclination: 51.62 deg. Period: 90.20 min. Launch delayed from October 22, 28 pending investigation of causes of failure of another Soyuz booster on 15 October. Soyuz-TMA 1 was a Russian automatic passenger craft. It carried the EP-4 visiting crew of three astronauts (two Russians and one Belgian) to automatically dock with the International Space Station (ISS). This was the first flight of the new Soyuz-TMA model. It was to remain parked at the ISS as the escape craft, relieving the Soyuz TM-34. The crew conducted several microgravity experiments on the ISS during their 10-day stay before returning in Soyuz TM-34. 2003 April 18 - . 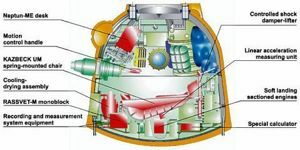 Soyuz TMA-2A (cancelled) - . Crew: Duque, Kotov, Padalka. Nation: Russia. Related Persons: Duque, Kotov, Padalka. Agency: RAKA. Program: ISS. Class: Manned. Type: Manned spacecraft. Flight: Soyuz TMA-2A. Spacecraft Bus: Soyuz. Spacecraft: Soyuz TMA. Soyuz TMA-2 was originally to switch lifeboats on the International Space Station. The crew would have returned to earth in the Soyuz TMA-1 already docked to the station. After the loss of Columbia, and the grounding of the remaining shuttles, it was decided instead that the EO-6 crew (Bowersox, Budarin, and Pettit) aboard the station would return in Soyuz TMA-1. Soyuz TMA-2 would be instead flown by a two-man skeleton crew (Malenchenko and Lu) to keep the station alive until shuttle flights could resume. 2003 April 26 - . 03:53 GMT - . Launch Site: Baikonur. Launch Complex: Baikonur LC1. LV Family: R-7. Launch Vehicle: Soyuz-FG. Soyuz TMA-2 - . Call Sign: Agat. Crew: Lu, Malenchenko. Backup Crew: Foale, Kaleri. Return Crew: Duque, Lu, Malenchenko. Payload: Soyuz TMA s/n 212. Mass: 7,250 kg (15,980 lb). Nation: Russia. Agency: RAKA. Manufacturer: Korolev bureau. Program: ISS. Class: Manned. Type: Manned spacecraft. Flight: Soyuz TMA-2. Spacecraft Bus: Soyuz. Spacecraft: Soyuz TMA. Duration: 184.95 days. Decay Date: 2003-10-28 . USAF Sat Cat: 27781 . COSPAR: 2003-016A. Apogee: 394 km (244 mi). Perigee: 386 km (239 mi). Inclination: 51.60 deg. Period: 92.40 min. Two-man Russian/American crew to provide minimal manning of space station while shuttle is grounded. Replaced three-man crew aboard ISS since before STS-107 disaster..
2003 October 18 - . 05:38 GMT - . Launch Site: Baikonur. Launch Complex: Baikonur LC1. LV Family: R-7. Launch Vehicle: Soyuz-FG. Soyuz TMA-3 - . Call Sign: Ingul. Crew: Duque, Foale, Kaleri. Return Crew: Foale, Kaleri, Kuipers. Payload: Soyuz TMA s/n 213. Mass: 7,250 kg (15,980 lb). Nation: Russia. Related Persons: Duque, Foale, Kaleri, Kuipers. Agency: RAKA. Manufacturer: Korolev bureau. Program: ISS. Class: Manned. Type: Manned spacecraft. Flight: Soyuz TMA-2, Soyuz TMA-3, Soyuz TMA-3 Cervantes. Spacecraft Bus: Soyuz. Spacecraft: Soyuz TMA. Duration: 194.77 days. Decay Date: 2004-04-30 . USAF Sat Cat: 28052 . COSPAR: 2003-047A. Apogee: 384 km (238 mi). Perigee: 376 km (233 mi). Inclination: 51.60 deg. Period: 92.20 min. The spacecraft carried the Expedition 8 crew of Mike Foale and Aleksandr Kaleri and the EP-5 (Cervantes) mission crewmember Pedro Duque. During the flight to the station spacecraft Commander was Aleksandr Kaleri . Soyuz TMA-3 docked with the Pirs module at 07:16 GMT on October 20. Once the EO-7 crew aboard the ISS was relieved, the roles switched, with Foale becoming the ISS Commander. Duque carried out out 24 experiments in the fields of life and physical sciences, Earth observation, education and technology. The experiments were sponsored by the European Space Agency and Spain. After ten days in space, Duque returned to earth with the EO-7 crew of Malenchenko and Lu aboard Soyuz TMA-2. 2003 November 12 - . Soyuz TMA-3A (cancelled) - . Crew: Dezhurov, Kuipers, Skripochka. Nation: Russia. Related Persons: Dezhurov, Kuipers, Skripochka. Agency: RAKA. Program: ISS. Class: Manned. Type: Manned spacecraft. Flight: Soyuz TMA-3A. Spacecraft Bus: Soyuz. Spacecraft: Soyuz TMA. Soyuz TMA-3 was originally to switch lifeboats on the International Space Station. The crew would have returned to earth in the Soyuz TMA-2 already docked to the station. After the Columbia disaster, the remaining shuttles were grounded. The Soyuz was then the only means of keeping the station manned. It was therefore decided that Soyuz TMA-3 would fly with the skeleton crew of Foale and Kaleri. 2004 April 19 - . 03:19 GMT - . Launch Site: Baikonur. Launch Complex: Baikonur LC1. LV Family: R-7. Launch Vehicle: Soyuz-FG. Soyuz TMA-4 - . Call Sign: Altair. Crew: Fincke, Kuipers, Padalka. Return Crew: Fincke, Padalka, Shargin. Payload: Soyuz TMA s/n 214. Mass: 7,250 kg (15,980 lb). Nation: Russia. Related Persons: Fincke, Kuipers, Padalka, Shargin. Agency: RAKA. Manufacturer: Korolev bureau. Program: ISS. Class: Manned. Type: Manned spacecraft. Flight: Soyuz TMA-3, Soyuz TMA-4, Soyuz TMA-4 Delta. Spacecraft Bus: Soyuz. Spacecraft: Soyuz TMA. Duration: 187.89 days. Decay Date: 2004-10-24 . USAF Sat Cat: 28228 . COSPAR: 2004-013A. Apogee: 367 km (228 mi). Perigee: 359 km (223 mi). Inclination: 51.60 deg. Period: 91.80 min. Soyuz TMA-4 was ISS transport mission ISS 8S and delivered the EO-9 caretaker crew of Gennadiy Padalka and Michael Fincke, together with the ESA/Netherlands Delta mission crewmember Andre Kuipers, to the Space Station. Soyuz TMA-4 docked with the nadir port on Zarya at 05:01 GMT on April 21 and the hatches to the ISS were opened at 06:30 GMT. Another gyro on the station had shut down prior to the docking and possibly would require a maintenance spacewalk to replace its failed electronics. After Soyuz TMA-5 docked with the ISS on October 16, the EO-9 crew handed activities over to the EO-10 crew. Soyuz TMA-4A (cancelled) - . Crew: Musabayev, Schlegel. Nation: Russia. Related Persons: Musabayev, Schlegel. Agency: RAKA. Program: ISS. Class: Manned. Type: Manned spacecraft. Flight: Soyuz TMA-4A. Spacecraft Bus: Soyuz. Spacecraft: Soyuz TMA. 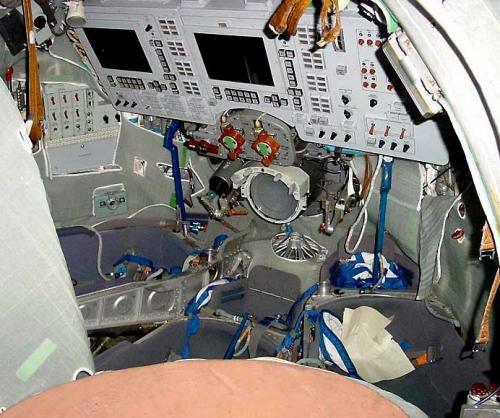 Soyuz TMA-4 was originally to switch lifeboats on the International Space Station. The crew would have returned to earth in the Soyuz TMA-3 already docked to the station. After the Columbia disaster, the remaining shuttles were grounded. The Soyuz was then the only means of keeping the station manned. It was therefore decided that Soyuz TMA-4 would fly with the skeleton crew of McArthur and Tokarev. 2004 October 14 - . 03:06 GMT - . Launch Site: Baikonur. Launch Complex: Baikonur LC1. LV Family: R-7. Launch Vehicle: Soyuz-FG. Soyuz TMA-5 - . Call Sign: Tien Shan. Crew: Chiao, Shargin, Sharipov. Return Crew: Chiao, Sharipov, Vittori. Payload: Soyuz TMA s/n 215. Mass: 7,250 kg (15,980 lb). Nation: Russia. Related Persons: Chiao, Shargin, Sharipov, Vittori. Agency: RKA. Program: ISS. Class: Manned. Type: Manned spacecraft. Flight: Soyuz TMA-5. Spacecraft Bus: Soyuz. Spacecraft: Soyuz TMA. Duration: 192.79 days. Decay Date: 2005-04-25 . USAF Sat Cat: 28444 . COSPAR: 2004-040A. Apogee: 359 km (223 mi). Perigee: 353 km (219 mi). Inclination: 51.60 deg. Period: 91.70 min. Soyuz TMA-5 docked with the Pirs module on October 16 at 0416 GMT. Aboard the spacecraft were the EO-10 crew of Sharipov and Chiao, and guest cosmonaut Shargin. After a week at the station, the EO-9 crew of Padalka and Fincke, together with Shargin, entered Soyuz TMA-4 at 18:14 GMT on October 23 and returned to earth. Chiao and Sharipov continued as the ISS skeleton station crew. 2005 April 15 - . 00:45 GMT - . Launch Site: Baikonur. Launch Complex: Baikonur LC1. LV Family: R-7. Launch Vehicle: Soyuz-FG. Soyuz TMA-6 - . Call Sign: Basalt. Crew: Krikalyov, Phillips, Vittori. Return Crew: Krikalyov, Olsen, Phillips. Payload: Soyuz TMA s/n 216. Mass: 7,250 kg (15,980 lb). Nation: Russia. Related Persons: Krikalyov, Olsen, Phillips, Vittori. Agency: RKA. Program: ISS. Class: Manned. Type: Manned spacecraft. Flight: Soyuz TMA-5, Soyuz TMA-6, Soyuz TMA-6 Eneide. Spacecraft Bus: Soyuz. Spacecraft: Soyuz TMA. Duration: 179.02 days. Decay Date: 2005-10-11 . USAF Sat Cat: 28640 . COSPAR: 2005-013A. Apogee: 360 km (220 mi). Perigee: 350 km (210 mi). Inclination: 51.60 deg. Period: 91.60 min. The Soyuz TMA-6 docked with International Space Station's Pirs module at 02:20 GMT on April 17. Commander of the long-duration EO-11 crew was Russian cosmonaut Sergey Krikalyov. Flight engineer and science officer was American astronaut John Phillips. Italian Roberto Vittori accompanied the EO-10 crew aboard Soyuz TMA-6 to the station on the European Space Agency EP-8 Eneide mission. 2005 October 1 - . 03:54 GMT - . Launch Site: Baikonur. Launch Complex: Baikonur LC1. LV Family: R-7. Launch Vehicle: Soyuz-FG. Soyuz TMA-7 - . Call Sign: Rassvet. Crew: McArthur, Olsen, Tokarev. Return Crew: McArthur, Pontes, Tokarev. Payload: Soyuz TMA s/n 217. Mass: 7,250 kg (15,980 lb). Nation: Russia. Related Persons: McArthur, Olsen, Pontes, Tokarev. Agency: NASA, RAKA, Shanghai Astronautics Bureau. Manufacturer: Korolev bureau. Program: ISS. Class: Manned. Type: Manned spacecraft. Flight: Soyuz TMA-6, Soyuz TMA-7, Soyuz TMA-8 ISS EP-10. Spacecraft Bus: Soyuz. Spacecraft: Soyuz TMA. Duration: 189.83 days. Decay Date: 2006-04-08 . USAF Sat Cat: 28877 . COSPAR: 2005-039A. Apogee: 348 km (216 mi). Perigee: 347 km (215 mi). Inclination: 51.60 deg. Period: 91.50 min. Launch delayed from September 27. Soyuz TMA-7 docked with the International Space Station at 05:27 GMT on 3 October, bringing the long duration EO-12 crew of (McArthur, Commander; Tokarev, Flight Engineer) and space tourist Olsen. McArthur, Tokarev and Pontes (brought to the station aboard Soyuz TMA-8) transferred to TMA-7 on April 8, 2006, closing the hatches at 17:15 GMT and undocking from Zvezda at 20:28 GMT, leaving Vinogradov and Williams from Soyuz TMA-8 as the Expedition 13 in charge of the station. Soyuz TMA-7 fired its engines at 22:58 GMT for the deorbit burn and landed in Kazakhstan at 23:48 GMT. 2006 September 18 - . 04:08 GMT - . Launch Site: Baikonur. Launch Complex: Baikonur LC1. LV Family: R-7. Launch Vehicle: Soyuz-FG. Soyuz TMA-9 - . Call Sign: Vostok. Crew: Ansari, Lopez-Alegria, Tyurin. Return Crew: Lopez-Alegria, Simonyi, Tyurin. Payload: Soyuz TMA s/n 219. Mass: 7,250 kg (15,980 lb). Nation: Russia. Related Persons: Ansari, Lopez-Alegria, Simonyi, Tyurin. Agency: RAKA. Manufacturer: Korolev bureau. Program: ISS. Class: Manned. Type: Manned spacecraft. Flight: Soyuz TMA-8, Soyuz TMA-9. Spacecraft Bus: Soyuz. Spacecraft: Soyuz TMA. Duration: 215.35 days. Decay Date: 2007-04-21 . USAF Sat Cat: 29400 . COSPAR: 2006-040A. Apogee: 348 km (216 mi). Perigee: 330 km (200 mi). Inclination: 51.60 deg. Period: 91.30 min. Carried the Expedition 14 crew and space tourist Anousheh Ansari to the International Space Station. Ansari replaced tourist Daisuke Enomoto, who was removed from flight status by the Russians just 28 days before the flight. Docked at the Zvezda port of the station at 05:21 GMT on September 20. On 21 April 2007, Lopez-Alegria, Tyurin and space tourist Charles Simonyi (who was taken to the station aboard Soyuz TMA-10) boarded Soyuz TMA-9, separated from the ISS, conducted retrofire, and landed in Kazakhstan at 12:31 GMT. 2007 April 7 - . 17:31 GMT - . Launch Site: Baikonur. Launch Complex: Baikonur LC1. LV Family: R-7. Launch Vehicle: Soyuz-FG. Soyuz TMA-10 - . Call Sign: Pulsar. Crew: Kotov, Simonyi, Yurchikhin. Return Crew: Kotov, Muszaphar, Yurchikhin. Payload: Soyuz TMA s/n 220 / ISS-14S. Mass: 7,200 kg (15,800 lb). Nation: Russia. Related Persons: Kotov, Muszaphar, Simonyi, Yurchikhin. Agency: RAKA. Manufacturer: Korolev bureau. Program: ISS. Class: Manned. Type: Manned spacecraft. Flight: Soyuz TMA-10, Soyuz TMA-10 ISS EP-12. Spacecraft Bus: Soyuz. Spacecraft: Soyuz TMA. Duration: 196.71 days. Decay Date: 2007-10-21 . USAF Sat Cat: 31100 . COSPAR: 2007-008A. Apogee: 341 km (211 mi). Perigee: 330 km (200 mi). Inclination: 51.60 deg. Period: 91.20 min. Carried the Expedition 15 crew and space tourist Charles Simonyi to the International Space Station. Soyuz TMA-10 docked at the Zarya port of the International Space Station at 19:10 GMT on 9 April. It undocked from Zarya at 19:20 GMT on Sep 27 September and docked at the Zvezda port at 19:47 GMT to clear Zarya for Soyuz TMA-10. The EO-15 crew and EP-13 space tourist Shukor (brought to the station by Soyuz TMA-11) boarded Soyuz TM-10 and undocked from the Zvezda port at 07:14 GMT on 21 October. The re-entry burn began at 09:47 and was normal. 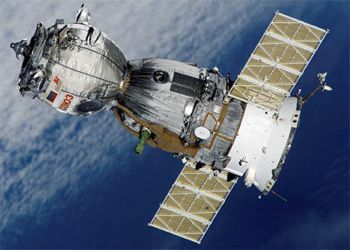 But afterwards, due to failure of an explosive bolt, the Soyuz service module remained connected to the re-entry capsule. The Soyuz tumbled, then began re-entry with the forward hatch taking the re-entry heating, until the connecting strut burned through. The Soyuz the righted itself with the heat shield taking the heating, but defaulted to an 8.6 G ballistic re-entry, landing 340 km short of the aim point at 10:36 GMT. Improved procedures after the ballistic re-entry of Soyuz TMA-1 meant a helicopter recovery crew reached the capsule only 20 minutes after thumpdown. However the true nature of the failure was concealed from the world until the same thing happened on Soyuz TMA-11. 2007 October 10 - . 13:22 GMT - . Launch Site: Baikonur. Launch Complex: Baikonur LC1. LV Family: R-7. Launch Vehicle: Soyuz-FG. Soyuz TMA-11 - . Call Sign: Agat. Crew: Malenchenko, Muszaphar, Whitson. Payload: Soyuz TMA s/n 221 / ISS 15S. Mass: 7,200 kg (15,800 lb). Nation: Russia. Related Persons: Malenchenko, Muszaphar, Whitson. Agency: RKA. Program: ISS. Class: Manned. Type: Manned spacecraft. Flight: Soyuz TMA-11, Soyuz TMA-11 ISS EP-13. Spacecraft Bus: Soyuz. Spacecraft: Soyuz TMA. Duration: 191.80 days. Decay Date: 2008-04-19 . USAF Sat Cat: 32256 . COSPAR: 2007-045A. Apogee: 344 km (213 mi). Perigee: 340 km (210 mi). Inclination: 51.60 deg. Period: 91.40 min. Soyuz TMA-11 delivered the EO-16 crew of Whitson and Malenchenko and EP-13 space tourist Shukor to the International Space Station. The Soyuz docked at the Zarya module at 14:50 GMT on 12 October. Whitson was EO-16 commander, with third astronaut Clay Anderson remaining aboard the station after the EO-15 crew and Shukor returned to earth on Soyuz TMA-10. Malenchenko and Whitson, together with visiting Korean astronaut Yi, who had been delivered to the ISS by Soyuz TMA-12, undocked from the station aboard Soyuz TMA-11 at 05:06 GMT on 19 April 2008. Following the deorbit burn at 07:40 GMT the aft service module of the Soyuz failed to separate and the spacecraft began re-entry in a reversed position, with the forward hatch taking the initial re-entry heating. As was the case with Soyuz 5 in 1970, the connections with the service module finally melted away, and the freed capsule righted itself aerodynamically with the heat shield taking the brunt of the re-entry heating. However the crew experienced a rough ride, a ballistic re-entry of over 8 G's force, smoke in the cabin, a failure of the soft landing system, and a very hard landing. They landed 470 km short of the target point at 50 deg 31" N, 61 deg 7" E at 08:29 GMT. A small grass fire was started at the landing point and the injured crew had to be helped from the capsule by passers-by. Malenchenko and Whitson suffered no permanent injury, but Yi was hit by Whitson's personal effects bag on impact and required physical therapy for neck and spine injuries. 2008 October 12 - . 07:01 GMT - . Launch Site: Baikonur. Launch Complex: Baikonur LC1. LV Family: R-7. Launch Vehicle: Soyuz-FG. Soyuz TMA-13 - . Call Sign: Titan. Crew: Fincke, Garriott, Richard, Lonchakov. Payload: Soyuz TMA s/n 223. Mass: 7,200 kg (15,800 lb). Nation: Russia. Related Persons: Fincke, Garriott, Richard, Lonchakov. Agency: RKA. Program: ISS. Class: Manned. Type: Manned spacecraft. Flight: Soyuz TMA-13. Spacecraft Bus: Soyuz. Spacecraft: Soyuz TMA. Duration: 178.01 days. Decay Date: 2009-04-08 . USAF Sat Cat: 33399 . COSPAR: 2008-050A. Apogee: 362 km (224 mi). Perigee: 352 km (218 mi). Inclination: 51.60 deg. Period: 91.70 min. Docked at the Zarya port of the ISS on 14 October at 08:26 GMT..
2009 March 26 - . 11:49 GMT - . Launch Site: Baikonur. Launch Complex: Baikonur LC1. LV Family: R-7. Launch Vehicle: Soyuz-FG. Soyuz TMA-14 - . Call Sign: Altair. Crew: Barratt, Padalka, Simonyi. Backup Crew: Dyson, Surayev, Walker. Return Crew: Barratt, Laliberte, Padalka. Payload: Soyuz TMA s/n 224. Mass: 7,250 kg (15,980 lb). Nation: Russia. Agency: RKA. Program: ISS. Class: Manned. Type: Manned spacecraft. Flight: Soyuz TMA-14. Spacecraft Bus: Soyuz. Spacecraft: Soyuz TMA. Duration: 198.66 days. Decay Date: 2009-10-11 . USAF Sat Cat: 34669 . COSPAR: 2009-015A. Apogee: 354 km (219 mi). Perigee: 344 km (213 mi). Inclination: 51.60 deg. Period: 91.50 min. Delivered EO-19 crew and space tourist Simonyi to ISS; returned EO-19 crew and space tourist Laliberte to earth on 11 October 2009 at 04:32 GMT..
2009 May 27 - . 10:34 GMT - . Launch Site: Baikonur. Launch Complex: Baikonur LC1. LV Family: R-7. Launch Vehicle: Soyuz-FG. Soyuz TMA-15 - . Call Sign: Parus. Crew: De Winne, Romanenko, Roman, Thirsk. Backup Crew: Hadfield, Kondratiyev, Kuipers. Payload: Soyuz TMA s/n 225. Mass: 7,250 kg (15,980 lb). Nation: Russia. Agency: RKA. Program: ISS. Class: Manned. Type: Manned spacecraft. Flight: Soyuz TMA-15. Spacecraft Bus: Soyuz. Spacecraft: Soyuz TMA. Duration: 187.86 days. Decay Date: 2009-12-01 . USAF Sat Cat: 35010 . COSPAR: 2009-030A. Apogee: 354 km (219 mi). Perigee: 344 km (213 mi). Inclination: 51.60 deg. Period: 91.50 min. Delivered EO-20 crew to the ISS. Returned to earth 1 December 2009..
2009 September 30 - . 07:14 GMT - . Launch Site: Baikonur. Launch Complex: Baikonur LC1. LV Family: R-7. Launch Vehicle: Soyuz-FG. Soyuz TMA-16 - . Call Sign: Bort. Crew: Laliberte, Surayev, Williams, Jeffrey. Backup Crew: Barrett, Skvortsov, Walker, Shannon. Return Crew: Surayev, Williams. Payload: Soyuz TMA s/n 226. Mass: 7,250 kg (15,980 lb). Nation: Russia. Agency: RKA. Program: ISS. Class: Manned. Type: Manned spacecraft. Flight: Soyuz TMA-16. Spacecraft Bus: Soyuz. Spacecraft: Soyuz TMA. Duration: 169.17 days. Decay Date: 2010-03-18 . USAF Sat Cat: 35940 . COSPAR: 2009-053A. Apogee: 352 km (218 mi). Perigee: 342 km (212 mi). Inclination: 51.60 deg. Period: 91.50 min. Docked with the International Space Station at 08:35 GMT on 2 October. Carried the EO-21 crew of Suraev and Williams, and space tourist Guy Laliberte due to the station. Surayev and Williams landed aboard Soyuz TMA-16 in Kazakhstan on 18 March 2010..
2011 April 4 - . 22:18 GMT - . Launch Site: Baikonur. Launch Complex: Baikonur LC1. LV Family: R-7. Launch Vehicle: Soyuz-FG. Soyuz TMA-21 - . Call Sign: Tarkhany / Gagarin. Crew: Borisenko, Garan, Samokutyayev. Backup Crew: Burbank, Ivanishin, Shkaplerov. Payload: Soyuz 7K-STMA s/n 231. Mass: 7,200 kg (15,800 lb). Nation: Russia. Agency: RKA. Program: ISS. Class: Manned. Type: Manned spacecraft. Flight: Soyuz TMA-21. Spacecraft Bus: Soyuz. Spacecraft: Soyuz TMA. Duration: 164.24 days. Decay Date: 2011-09-16 . USAF Sat Cat: 37382 . COSPAR: 2011-012A. Apogee: 347 km (215 mi). Perigee: 343 km (213 mi). Inclination: 51.60 deg. Period: 91.40 min. ISS EO-27 crew. 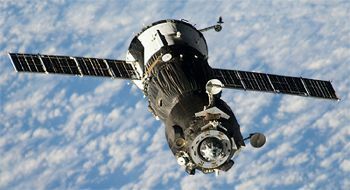 The Soyuz docked at the Poisk module of the ISS at 23:09 GMT on 6 April, and undocked at 00:38 GMT on 16 September 2011, eight days later than planned due to the Progress M-11M launch failure. A dropout of communications after the reentry burn caused concern, but the crew landed safely in Kazakhstan at 03:59 GMT. 2011 November 14 - . 04:14 GMT - . Launch Site: Baikonur. Launch Complex: Baikonur LC1. LV Family: R-7. Launch Vehicle: Soyuz-FG. Soyuz TMA-22 - . Call Sign: Astraeus. Crew: Burbank, Ivanishin, Shkaplerov. Backup Crew: Acaba, Padalka, Revin. Payload: Soyuz 7K-STMA s/n 232. Mass: 7,200 kg (15,800 lb). Nation: Russia. Agency: RKA. Program: ISS. Class: Manned. Type: Manned spacecraft. Flight: Soyuz TMA-22. Spacecraft Bus: Soyuz. Spacecraft: Soyuz TMA. Duration: 165.31 days. Decay Date: 2012-04-27 . USAF Sat Cat: 37877 . COSPAR: 2011-067A. Apogee: 410 km (250 mi). Perigee: 376 km (233 mi). Inclination: 51.60 deg. Period: 92.40 min. Launch delayed two months to verify booster after launch failure of Progress M-12M in August 2011. After successful launch of Progress M-13M on 30 October, Soyuz TMA-22 was cleared for launch. Delivered the EO-29 crew to the ISS, docking at the Poisk module of the station at 05:24 GMT on 16 November. Undocked on 27 April 2012 at 08:15 GMT and landed in Kazakhstan at 11:45 GMT. 2012 May 15 - . 03:01 GMT - . Launch Site: Baikonur. Launch Complex: Baikonur LC1. LV Family: R-7. Launch Vehicle: Soyuz-FG. Soyuz TMA-04M - . Call Sign: Altair. Crew: Acaba, Padalka, Revin. Backup Crew: Ford, Kevin, Novitskiy, Tarelkin. Payload: Soyuz TMA s/n 705. Mass: 7,200 kg (15,800 lb). Nation: Russia. Program: ISS. Class: Manned. Type: Manned spacecraft. Flight: Soyuz TMA-04M. Spacecraft Bus: Soyuz. Spacecraft: Soyuz TMA. Duration: 124.99 days. Decay Date: 2012-09-17 . USAF Sat Cat: 38291 . COSPAR: 2012-022A. Apogee: 406 km (252 mi). Perigee: 392 km (243 mi). Inclination: 51.60 deg. Period: 92.50 min. Docked at the station's Poisk module on 17 May at 04:36 GMT. On 16 September at 23:09 GMT undocked from the station to return the crew to earth. Soyuz TMA-04M flew for 2 hr 47 min in a 403 km x 426 km orbit, then fired its engines for the deorbit burn at 01:56 GMT on 17 September to enter a 13 kmx 425 km reentry orbit. The crew landed safely in Kazakhstan at 02:23 GMT. 2012 July 15 - . 02:40 GMT - . Launch Site: Baikonur. Launch Complex: Baikonur LC1. LV Family: R-7. Launch Vehicle: Soyuz-FG. Soyuz TMA-05M - . Call Sign: Agate. Crew: Hoshide, Malenchenko, Williams. Backup Crew: Hadfield, Marshburn, Romanenko, Roman. Payload: Soyuz TMA s/n 706. Mass: 7,200 kg (15,800 lb). Nation: Russia. Program: ISS. Class: Manned. Type: Manned spacecraft. Flight: Soyuz TMA-05M. Spacecraft Bus: Soyuz. Spacecraft: Soyuz TMA. Duration: 126.97 days. Decay Date: 2012-11-19 . USAF Sat Cat: 38671 . COSPAR: 2012-037A. Apogee: 428 km (265 mi). Perigee: 403 km (250 mi). Inclination: 51.60 deg. Period: 92.90 min. Docked with the ISS at 04:51 GMT on 17 July. Undocked at 22:26 GMT on 18 November; landed in Kazakhstan at 01:53 GMT on 29 November..
2012 December 19 - . 12:12 GMT - . Launch Site: Baikonur. Launch Complex: Baikonur LC1. LV Family: R-7. Launch Vehicle: Soyuz-FG. Soyuz TMA-07M - . Call Sign: Parus. Crew: Hadfield, Marshburn, Romanenko, Roman. Backup Crew: Nyberg, Parmitano, Yurchikhin. Payload: Soyuz TMA s/n 704A. Mass: 7,200 kg (15,800 lb). Nation: Russia. Program: ISS. Class: Manned. Type: Manned spacecraft. Flight: Soyuz TMA-07M. Spacecraft Bus: Soyuz. Spacecraft: Soyuz TMA. Duration: 145.60 days. Decay Date: 2013-05-14 . USAF Sat Cat: 39032 . COSPAR: 2012-074A. Apogee: 421 km (261 mi). Perigee: 402 km (249 mi). Inclination: 51.60 deg. Period: 92.80 min. Docked with the Rassvet module of the ISS at 14:09 GMT on 21 December. Undocked at 23:08 GMT on 13 May 2013. Retrofire at 01:37 GMT on 14 May was followed by landing in Kazakhstan at 02:31 GMT..
2013 May 28 - . 20:31 GMT - . Launch Site: Baikonur. Launch Complex: Baikonur LC1. LV Family: R-7. Launch Vehicle: Soyuz-FG. Soyuz TMA-09M - . Call Sign: Olympus. Crew: Nyberg, Parmitano, Yurchikhin. Backup Crew: Mastracchio, Tyurin, Wakata. Payload: Soyuz TMA s/n 709. Mass: 7,200 kg (15,800 lb). Nation: Russia. Program: ISS. Class: Manned. Type: Manned spacecraft. Flight: Soyuz TMA-09M. Spacecraft Bus: Soyuz. Spacecraft: Soyuz TMA. Duration: 166.26 days. Decay Date: 2013-11-11 . USAF Sat Cat: 39170 . COSPAR: 2013-025A. Apogee: 421 km (261 mi). Perigee: 409 km (254 mi). Inclination: 51.65 deg. Period: 92.88 min. Docked with the Rassvet module of the ISS at 02:10 GMT on 29 May after a 5 hour 39 minute flight. On 1 November 2013 Yurchikin, Nyberg and Parmitano, undocked from the Rassvet module at 08:33 GMT and flew around the station at a distance of 200 m to redock at 08:54 GMT with the Zvezda aft port freed up by ATV-4. Undocked from the Zvezda module on 10 November at 23:26 GMT and landed in Kazakhstan at 02:49 GMT on 11 November. 2013 November 7 - . 04:14 GMT - . Launch Site: Baikonur. Launch Complex: Baikonur LC1. LV Family: R-7. Launch Vehicle: Soyuz-FG. Soyuz TMA-11M - . Call Sign: Vostok. Crew: Mastracchio, Tyurin, Wakata. Backup Crew: Gerst, Surayev, Wiseman. Payload: Soyuz TMA s/n 711. Mass: 7,200 kg (15,800 lb). Nation: Russia. Program: ISS. Class: Manned. Type: Manned spacecraft. Flight: Soyuz TMA-11M. Spacecraft Bus: Soyuz. Spacecraft: Soyuz TMA. Duration: 187.91 days. Decay Date: 2014-05-14 . USAF Sat Cat: 39373 . COSPAR: 2013-061A. Apogee: 418 km (259 mi). Perigee: 415 km (257 mi). Inclination: 51.65 deg. Period: 92.90 min. Docked with the Rassvet module of the ISS at 10:27 GMT the day of launch. Undocked from the Rassvet module at 22:36 GMT on May 13 and made the deorbit burn at 01:05 GMT May 14. Landing in Kazakhstan came at 01:58:30 GMT on May 14..
2014 May 28 - . 19:57 GMT - . Launch Site: Baikonur. Launch Complex: Baikonur LC1. LV Family: R-7. Launch Vehicle: Soyuz-FG. Soyuz TMA-13M - . Call Sign: Cepheus. Crew: Gerst, Surayev, Wiseman. Backup Crew: Cristoforetti, Shkaplerov, Virts. Payload: Soyuz TMA s/n 713. Mass: 7,200 kg (15,800 lb). Nation: Russia. Program: ISS. Class: Manned. Type: Manned spacecraft. Flight: Soyuz TMA-13M. Spacecraft Bus: Soyuz. Spacecraft: Soyuz TMA. Duration: 165.33 days. Decay Date: 2014-11-10 . USAF Sat Cat: 39775 . COSPAR: 2014-031A. Apogee: 417 km (259 mi). Perigee: 412 km (256 mi). Inclination: 51.65 deg. Period: 92.85 min. Docked with the Rassvet module of the ISS at 01:44 GMT May 29. Undocked from Rassvet at 00:31 GMT on November 10. The deorbit burn at 03:05 GMT reduced velocity by 128 m/s, dipping perigee into the atmosphere. Landed in Kazakhstan at 03:58 GMT..
2014 September 25 - . 20:25 GMT - . Launch Site: Baikonur. Launch Complex: Baikonur LC1. LV Family: R-7. Launch Vehicle: Soyuz-FG. Soyuz TMA-14M - . Call Sign: Tarkhany. Crew: Samokutyayev, Serova, Wilmore. Backup Crew: Kelly, Scott, Korniyenko, Padalka. Payload: Soyuz TMA s/n 714. Mass: 7,200 kg (15,800 lb). Nation: Russia. Program: ISS. Class: Manned. Type: Manned spacecraft. Flight: Soyuz TMA-14M. Spacecraft Bus: Soyuz. Spacecraft: Soyuz TMA. Duration: 167.24 days. Decay Date: 2015-03-12 . USAF Sat Cat: 40246 . COSPAR: 2014-057A. Apogee: 408 km (253 mi). Perigee: 396 km (246 mi). Inclination: 51.65 deg. Period: 92.60 min. Expedition 42 crew transported to the ISS (Samokutyaev, Wilmore and Serova). The port solar array failed to deploy after Soyuz separated from the launch vehicle third stage, but this did not impact the rendezvous. Soyuz TMA-14M docked with the Poisk module of the ISS at 02:11 GMT on September 26. Serova was the fourth Russian woman in space but the first since 1997. On March 11 2015 at 22:44 GMT Soyuz TMA-14M undocked from the Poisk module with the same crew aboard. It performed its deorbit burn at 01:16 GMT March 12 and landed in Kazakhstan at around 02:08 GMT. 2015 March 27 - . 19:42 GMT - . Launch Site: Baikonur. Launch Complex: Baikonur LC1. LV Family: R-7. Launch Vehicle: Soyuz-FG. Soyuz TMA-16M - . Call Sign: Altair. Crew: Kelly, Scott, Korniyenko, Padalka. Backup Crew: Ovchinin, Volkov, Sergey, Williams, Jeffrey. Return Crew: Aimbetov, Mogensen, Padalka. Payload: Soyuz TMA s/n 716. Mass: 7,200 kg (15,800 lb). Nation: Russia. Program: ISS. Class: Manned. Type: Manned spacecraft. Flight: Soyuz TMA-16M. Spacecraft Bus: Soyuz. Spacecraft: Soyuz TMA. Duration: 168.21 days. Decay Date: 2015-04-05 . USAF Sat Cat: 40540 . COSPAR: 2015-016A. Apogee: 213 km (132 mi). Perigee: 198 km (123 mi). Inclination: 51.60 deg. Docked with the Poisk module of the ISS at 5 hours 50 minutes after launch. Padalka was the commander, and Kelly and Kornienko were part of a long-duration crew that would spend nearly a year aboard the space station. On 28 August Padalka, Kelly and Kornienko flew Soyuz TMA-16M from the Poisk to Zvezda docking ports. Undocking from Poisk was at 07:12 GMT and docking with Zvezda was at 07:30 GMT. This freed the Poisk port for the TMA-18M arrival, and freed Zvezda for a refuelling spacecraft once TMA-16M returned to Earth. ISS EO- 44 concluded when Soyuz TMA-16M undocked from the Zvezda aft port at 21:29 GMT on 11 September, carrying Expedition 44 commander Padalka and EP-18 visiting crew members Mogensen and Aimbetov. Soyuz TMA-16M landed in Kazakhstan at 00:51:36 GMT on 12 September. 2015 September 2 - . 04:37 GMT - . Launch Site: Baikonur. Launch Complex: Baikonur LC1. LV Family: R-7. Launch Vehicle: Soyuz-FG. Soyuz TMA-18M - . Call Sign: Eridanus. Crew: Aimbetov, Mogensen, Volkov, Sergey. Backup Crew: Skripochka, Pesquet, Prokopyev. Return Crew: Volkov, Sergey, Kelly, Scott, Korniyenko. Payload: Soyuz TMA s/n 718. Mass: 7,200 kg (15,800 lb). Nation: Russia. Program: ISS. Class: Manned. Type: Manned spacecraft. Flight: Soyuz TMA-18M. Spacecraft Bus: Soyuz. Spacecraft: Soyuz TMA. Duration: 181.99 days. Decay Date: 2016-03-02 04:25:00 . USAF Sat Cat: 40885 . COSPAR: 2015-043A. Apogee: 406 km (252 mi). Perigee: 398 km (247 mi). Inclination: 51.65 deg. Period: 92.60 min. Docked with ISS at the Poisk port at 07:39 GMT on 4 September. On Mar 2 at 0102 UTC Volkov, Kornienko and Kelly, aboard Soyuz TMA-18M, undocked from the Poisk module, concluding Expedition 46. Tim Kopra then became commander of Expedition 47, with flight engineers Yuriy Malenchenko and Tim Peake. Soyuz TMA-18M made the deorbit burn at 0332 UTC and landed in Kazakhstan at 0426 UTC. Soyuz commander Volkov had spent six months in space, while Kornienko and Kelly completed 340d 8h 21min in space, or about 0.93 years. 2016 March 18 - . 21:26 GMT - . Launch Site: Baikonur. Launch Complex: Baikonur LC1. LV Family: R-7. Launch Vehicle: Soyuz-FG. Soyuz TMA-20M - . Call Sign: Kazbek. Crew: Ovchinin, Skripochka, Williams, Jeffrey. Backup Crew: Ryzhikov, Borisenko, Kimbrough. Return Crew: Ovchinin, Skripochka, Williams, Jeffrey. Nation: Russia. Program: ISS. Class: Manned. Type: Manned spacecraft. Flight: Soyuz TMA-20M. Spacecraft Bus: Soyuz. Spacecraft: Soyuz TMA. Duration: 172.16 days. Decay Date: 2016-09-07 01:13:00 . USAF Sat Cat: 41391 . COSPAR: 2016-018A. Apogee: 230 km (140 mi). Perigee: 193 km (119 mi). Inclination: 51.60 deg. Soyuz TMA-20M was launched carrying Alexey Ovchinin, Oleg Skripochka and Jeff Williams. This was the last of the 11F732A47 Soyuz TMA-M series, which were replaced by the improved Soyuz-MS variant. On Sep 6 at 2151 UTC Soyuz TMA-20M undocked from the Poisk module with Ovchinin, Skripochka and Williams. The spacecraft laded in Kazakhstan at 0113 UTC on Sep 7.